This article is about the Jackson 5 album. For The Shocking Blue album, see Third Album (Shocking Blue album). For other uses, see Third (disambiguation). 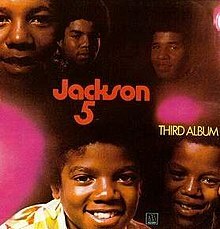 Third Album is the third studio album released by the Jackson 5 on Motown Records, and the group's second LP released in 1970. Third Album featured the group's fourth consecutive No. 1 single on the US pop charts, "I'll Be There", the Top 5 single, "Mama's Pearl", and album tracks such as the semi-autobiographical "Goin' Back to Indiana", and "Darling Dear". The album peaked at No. 4 on the Billboard album charts and No. 1 on the R&B album charts and also No. 1 on Cashbox. This is considered one of their best efforts and is their most successful album to date. It sold over 6 million copies worldwide. Allmusic's Lindsay Planer rated Third Album four out of five stars. She stated that the album contains "the unmistakable Motown sound, expanding just enough to incorporate other significant influences as well." She also stated that a few of the tracks "are [...] worthwhile spins." In 2001, Motown Records remastered all J5 albums in a "Two Classic Albums/One CD" series (much like they did in the late 1980s). This album was paired up with Maybe Tomorrow. The bonus tracks were "Sugar Daddy", the only new track on their 1971 greatest hits set, and "I'm So Happy", the B-side of that single. ^ "楽天が運営するポータルサイト ： 【インフォシーク】Infoseek". Msdb.hp.infoseek.co.jp. 2000-01-01. Retrieved 2012-03-12. ^ Chery, Carl: XXL: Michael Jackson Special Collecters Edition, page 99. ^ a b Planer, Lindsay. Third Album - The Jackson 5 at AllMusic. Retrieved July 5, 2011. ^ "RPM: The Jackson 5 (albums)". RPM Magazine. Archived from the original on October 14, 2017. Retrieved April 12, 2017. ^ "The Jackson 5 US Chart History". Billboard. Retrieved April 12, 2017. This page was last edited on 6 April 2019, at 06:27 (UTC).